I started this blog on May 14, 2009. The general concept had been floating around in my head since 2003, when I wrote the phrase “waking up famous” on a list of possible short story titles, none of which I’ve ever written. But I latched onto the idea that waking up famous was a choice, and that fame wasn’t about the perceived glitz and glamour that so many people associate with the word; it is about being the best you can be in any given moment. A few months later, I bought the domain name wakingupfamous.com, and did a whole lot of nothing with it for four or five years before releasing it back into cyberspace. Okay… add the “Books I Liked” widget from Amazon.com. Yes, they were all books that I read and liked—all six or seven of them—but I always felt funny about its being there, as if I’d invited friends over for a dinner party and casually left a table of yard sale items in the dining room just in case they might want to buy something. I finished reading Chris Guillebeau’s book The Art of Non-Conformity on February 13, and signed up to be an affiliate moments later, because I have always been moved by the genuine, no-nonsense, I am NOT your guru writing style on his blog. Again, my thought was not, “Ooh! This might make me rich!” I had simply found someone whose ideas I was eager to pass along to friends and to anyone who found his or her way to my blog, for whatever reason. Even then, I did not rush off and throw a new widget on the wall. I wanted to take the time to explain why I was placing an affiliate link on my blog; I just didn’t expect to take three months to do it. What brought me to the page tonight began as an intention to send a “Thank you” email to Chris Guillebeau, because he sent me a copy of his new book, The $100 Startup. Getting a package that you were expecting because you ordered something online is nice. Getting a package that you weren’t expecting—and finding that it contains something you really wanted but had not yet ordered—is very nice. And, it reminded me why I “affiliated” myself with him in the first place. Because he’s that guy. He has created a life that feeds his spirit, and he has tirelessly gone about encouraging others to do the same thing—not the same thing that he is doing, necessarily, but to create lives that feed their spirits. 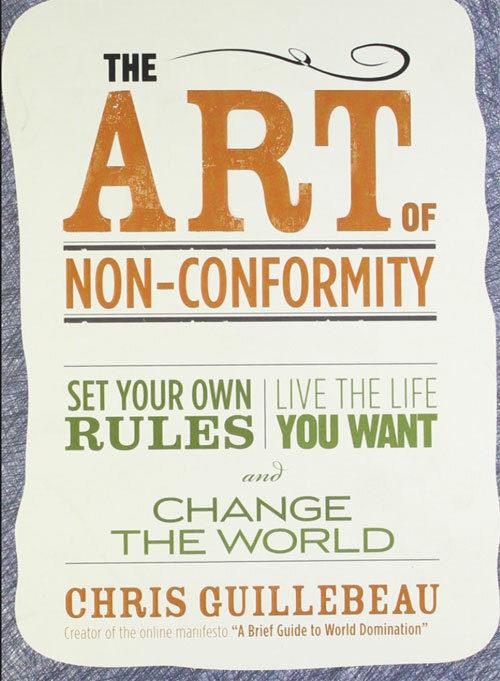 My fear with Guillebeau’s “The Art Of Non-Conformity” is not so much that the book contains few original ideas, but the fact that those who read the book are likely already converts of this particular way of living. Essentially, Guillebeau is preaching to the choir, when in reality, the people who need to hear his message most are probably the people who don’t read books at all – or at least not books like this. The overall review wasn’t hateful or caustic—the author says he is “still a fan of Chris Guillebeau and his work…and [he will] continue to read his blog”—but I couldn’t fathom why anyone would go out of his way to dissuade others from reading something. Calling it “less than motivational” except, perhaps, to anyone “living under a rock for the past ten years” sounds an awful lot like sour grapes or subscriber envy. Recommend books you like, don’t recommend books you don’t like, but don’t try to prevent people from buying or reading something just because it didn’t strike a big enough chord with you. Or because three of the five people who reviewed your books on Amazon.com told people to save their money. With that, I am shamelessly placing a link to Chris Guillebeau’s work on my blog. If you click the link, like what you see, and decide to buy something, I’ll get a little love in my virtual tip jar. And that’s okay, because I sincerely believe that you will be richer for it. I’ll check back in with my thoughts on The $100 Startup.